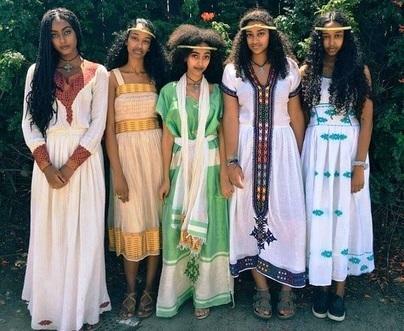 The habesha kemis is the traditional clothing of women in Ethiopia. This ankle length, chiffon-made, snow white dress is usually worn at formal events. To classify Ethiopia's national costume into one easily identifiable variety is a daunting task. 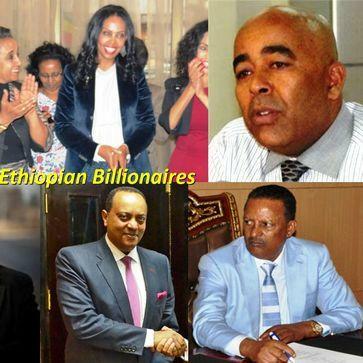 There are of course the well known snow white outfits that have been commonly associated with Ethiopia's national identity but this is just the tip of the iceberg. Each tribe or ethnic group that resides within Ethiopia's borders has its own styles and varieties. Ethiopia is a large country with a wide range of climates and landscapes. This, in itself, is a cause for the differences in attire among the diverse peoples of the country. For example, people who reside in the lowlands opt for lighter weight clothing because of the heat, while their neighbors in the highlands prefer heavier clothing due to the colder weather. Amhara women in colder climates tend to wear clothing that covers them more. Oromo women in warmer climates tend to wear less heavier clothing. The all white outfit, can be considered as the Ethiopian national costume, due to it's wide spread use and general acceptance but one has to take into account that there are a multitude of striking variations. 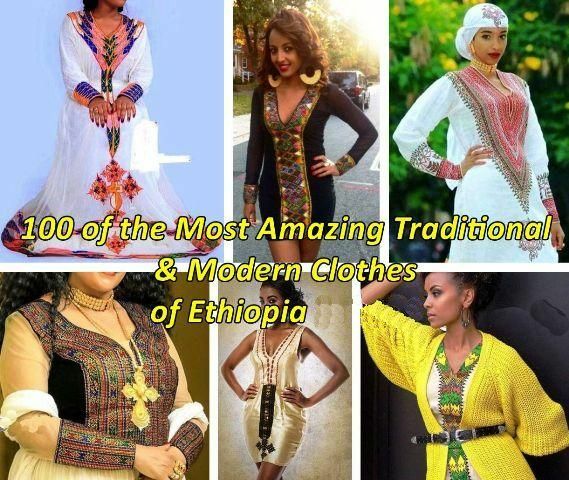 For example, the women of Harar adorn themselves in purple, red, and black dresses, while the Oromo peoples of Bale prefer leather garments and the Afaris choose to wear brightly colored wraps made of cotton. Even with all this variety, the difference in the clothing design or color is not what sets them apart for identification. As a matter of fact, it is the hairstyles, jewelry, and embroidery patterns that helps in differentiating the various tribes and ethnic groups. For example, the women of Amhara and Tigray tend to use lots of braids when doing their hair, while Harari women use buns behind their ears, etc. The embroidery patterns vary on a massive scale from tribe to tribe, from ethnic group to ethnic group. This would be a great topic of interest for cultural tourists as well as for the many diverse Ethiopians themselves. In North America and Europe, this dress has been referred to as "Ethiopian coffee dress", a referenc to the traditional Ethiopian coffee ceremony. "Habesha kemis" which is in Amharic, the official Ethiopian language, refers to the national traditional outfit of Ethiopian women. It is often a long snow white dress decorated with embroidery and accompanied with a shawl called "netela". It is a very thin and delicate scarf made from cotton and is rather large: about 160 x 260 cm or 63 x 102 inches. The embroidery done on the ends of the "netela" are usually decorated to match the dress it accompanies. The "netela" is also used as a way to communicate what the wearer is feeling or doing. Normally, the "netela" covers the back and shoulders, with the embroidered end folded over the right shoulder. For mourning occasions, the "netela's" embroidered end is wrapped around the face. When it comes to religious occasions or activities, the "netela" is wrapped over the back and shoulders and the embroidered end is folded over the right shoulder. When the wearer is relaxing, the shawl is placed with the embroidered end over the left shoulder. Two shawls one for the head and one likewise for the shoulders can be used by the female wearing this Ethiopian traditional dress. Although, it is most often used, one should remember the "netela" is not the only form of wrap around for the Ethiopian female. There are the "fota", the "docho" and the "gabi". The "fota" a sort of towel looking piece is brighter and usually checkered. Its size is about 147 x 268 cm or 58 x 105 inches. The "docho" is only worn by married women and is very long. The size of the "docho" is usually about 8 meters or 26 feet long. The "gabi" is not really a scarf in the normal sense, but more like a light blanket. It is thicker and warmer than the "netela" and usually worn by men but women can use it at home to keep warm. Ethiopian women often wear netela with borders of coloured embroidered designs. To illustrate how the "habesha kemis" could vary by ethnicity and tribe, let us look at the Shewa and Gondar versions. For Shewa women, the white linen has embroidery on the cuffs, in the middle, on the bottom, or on all three. This is paired with the white "netela" or scarf wrap around of the same fabric and design color. The Gondar type on the other hand has a thick rim of embroidery on the bottom hem, but only on the back. 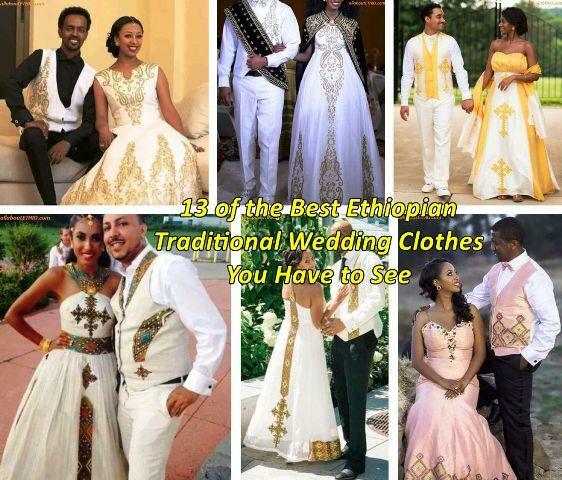 There is also another traditional dress that is made from a thicker fabric that is loose around the arms with symbols of the Ethiopian Orthodox Cross. When donning their national costume Ethiopian men wear white knee length shirts, white trousers, a sweater, knee high socks and the wrap around "gabi", which we elaborated on earlier. This outfit is traditionally all white yet in some cases there is some nice embroidery work done on the front of the shirts and on the collars. The gabi can also have some embroidery on the ends but this is rare for the men folk.